In the previous episode in this series, we looked at ways to polish your podcast, now we’re going to look at where you can host the finished product. Before we do that however, we’d better have a look at the science behind podcasting, the RSS feed. Podcasting uses RSS, a system which allows users to ‘subscribe’ to a feed. Once subscribed, this feed allows users to be notified whenever a new ‘episode’ of a podcast is available for download. RSS feeds tell the internet when a new podcast is uploaded. Ideally wherever you host your podcast should be able to generate this RSS feed. Here are a couple that do. My preferred option would be to host the podcast using Libsyn. Libsyn will host the audio, generate the RSS feed and also give you HTML code so you can embed the podcast on your website. The basic package starts at just $5 per month. 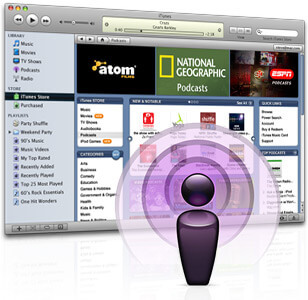 Libsyn is one of the most popular podcast hosting sites on the internet. I use the $7 a month Libsyn plan and get access to stats to see how many people have listened per month. You might not know this but you can upload a podcast to your Soundcloud account and Soundcloud will generate the all important RSS feed for you. You may need to upgrade to a Pro Unlimited account if you regularly uploading lengthy podcasts as you’ll soon find you need the unlimited storage that the Pro Unlimited account offers. Check out the official Soundcloud guide to Podcast hosting here. If your band website is powered by WordPress, you can use the Blubrry PowerPress plugin to upload and host from your own WordPress account. For a completely free hosting alternative alternative you can upload the podcast mp3 audio to YouTube as a ‘cover art’ video. Click here to read our earlier 60SMM blog post about the ‘Tunes To Tube’ website that can make this happen. In the next part of this series, we’ll look at content ideas to include within your podcast.